Last week, I said that I'd give you the inspiration behind my story, 'One More Step', which is in the current People's Friend Fiction Special. As writers, we are often told not to write too much from fact and usually, when writing short stories, I try and stick to that - just adding in snippets of truth here and there. This story, though, is semi-autobiographical. It is about a woman who used to work in a primary school but who, after meeting the love of her life and marrying for the second time, chooses to give her teaching career up to follow her dream of being a photographer. The only problem is, the garage is full of memories of her old life - her folders full of worksheets and lesson plans as well as reference books. Although her husband wants her to empty the garage, she is afraid that getting rid of everything related to the job that gave her security after her first marriage failed, will jinx her ideal life. With her husband's help, Trudy finally realises that clearing out the garage won't mean that history will repeat itself and they do the task together. 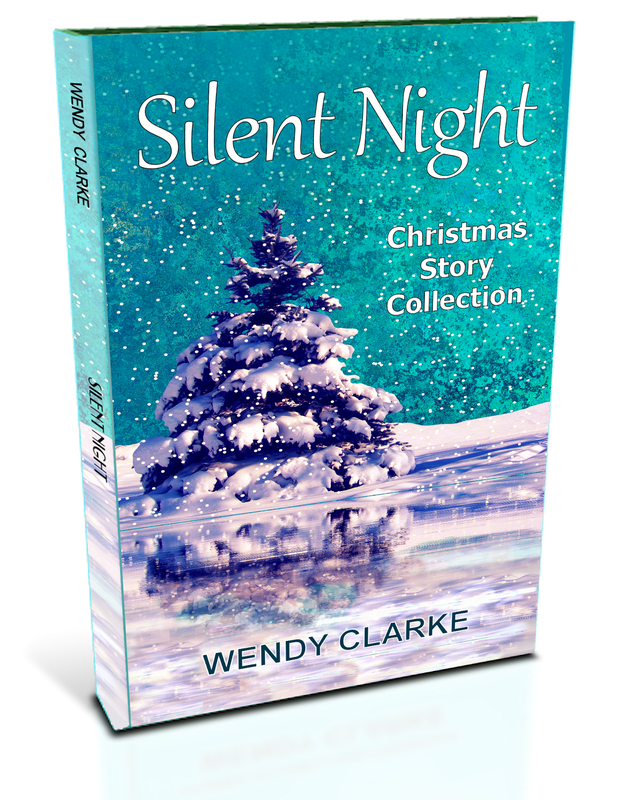 I wrote this story after having one of my teacake sessions with Tracy Fells. I told her I was having difficulty letting go of my teaching paraphernalia even though it was taking up valuable space in the garage. I told her a little of the background to my difficulty and she told me to go home and write the story (this has happened a few times now and she is going to want commission soon!) so I did. Of course there are some differences in my own story: for a start I didn't give up teaching, I was made redundant when my school closed three years ago and just never went back to it. It was not photography I chose to pursue but writing although, like Trudy's husband, my own husband was one hundred percent behind my decision to change career. Finally, my lovely husband and I have been married four years not one. Is my reason for hanging on to all my teaching things (even though I never intend to be a teacher again) the same as Trudy's? Well, I didn't know it was before I wrote 'One More Step', but maybe there is an element of truth in it - teaching was my security in the years when I was a single parent and maybe I'm afraid to let that go... after all, it's not as if writing would pay the bills, is it! Now, I know you're wondering whether I have cleared the garage yet. All I will say is that I've heard that the weekend is going to be fine, and we have no plans - so guess what we'll both be doing tomorrow? Lots of nice things have happened since my last post - so I thought this one could be a lot of bits and pieces of news. My most recent news is that I have a story in both the weekly People's Friend and the Special. The first, which is called A Gift of Hope, is one of my WW1 stories. It's written in first person from the male perspective (which I really like) and although short, is one of my favourite stories. I absolutely love Jim Dewar's illustration. The second story, One More Step, was one I was asked to write for Andre Leonard's great illustration. It is semi-autobiographical and I will be sharing with you the inspiration behind the story in my next post. My story, 'Holy Toast' is in this month's Take a Break Fiction Feast and is a humorous piece, which is unusual for me - but I though it might be fun to have a go at something new. I'm now trying to think up some other ideas that might work as a light-hearted story, so I can have another go. 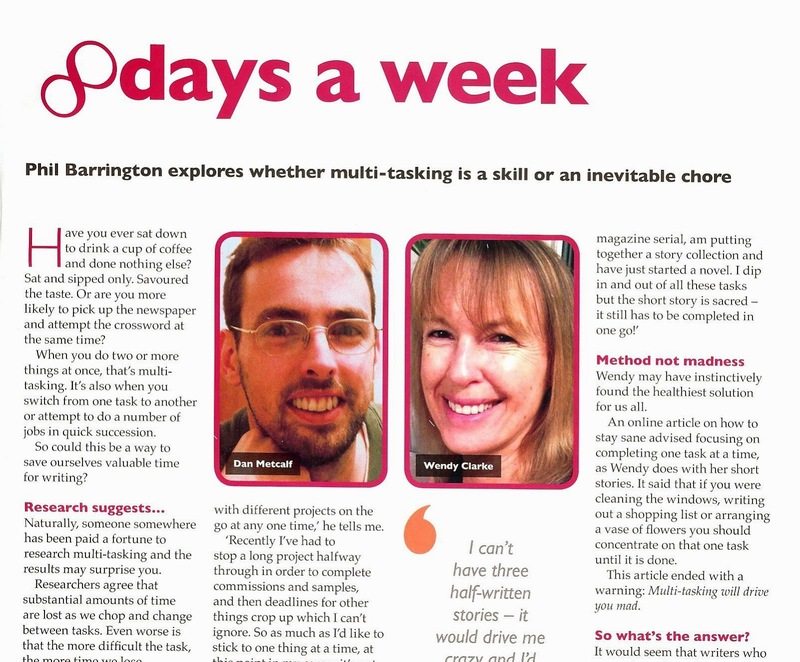 Also, I am pleased to be featured in Phil Barrington's 8 Days a Week article in Writer's Forum - where I am giving the female perspective on multi-tasking. In other news, I was very excited to go to the paperback book launch of Juliet West's fabulous 'Before the Fall'. She is a marvellous speaker and an inspiration to us all. While there, I met up with one of my favourite authors, Ann Weisgarber, author of 'The Promise' who had come over from America - fabulous to chat to her. I also drove two hours to Della Galton's course on 'How to Market Your Book'. Della was a guest on my blog a while back and you can find her post on the link at the side. It was lovely to meet her and also fellow womagwriter, Kath McGurl. It was a great course but I hope that Della's statement that 'short story collections don't sell', won't be true! Last but by no means least, my new ear grommets work... I can now fly pain free - yippee! It gives me great pleasure to welcome today's guest, Cally Taylor, to my blog. 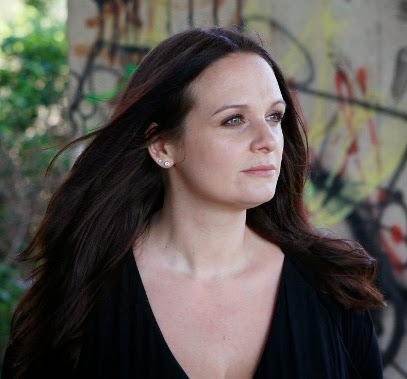 Cally has moved from short stories to rom-com novels and finally has made her name as the author of psychological thriller The Accident. I wanted to find out a little more about her diverse journey. Welcome to my blog, Cally - it's great to have you here. Wonderful to be here. Thanks so much for asking me, Wendy. It's my pleasure. Now I've been dying to ask - in the days when you were writing short stories, did you ever imagine that you would one day be a published author? I never dreamed I’d be a published author one day. I’ve always been a voracious reader and, to me, authors were mythical creatures who lived in the fairy-tale world of ‘Publishing’. They weren’t ordinary people who had families and full time jobs and spent their childhood holidays in caravans in soggy Aberystwyth. No, their great-grandfathers were authors, they lived in Bloomsbury or Hampstead or Primrose Hill and they hung out at the Ivy. It was all about who you knew and where you went to school. Or so I thought. I felt the same about short story writers when I first started sending my stories in to the women’s magazines. I saw two names popping up all the time – Della Galton and Teresa Ashby – and I assumed they were in on ‘the big secret’ of women’s magazine publishing (whatever that may be) or they somehow knew the editors. The truth, I discovered years later, was that they’re exactly the same as me. They’re women who love telling stories and who worked really, really hard to see their work in print. It’s the same with authors. There’s no ‘club’ you need to be part of, no secret network you need to join, you just have to write a stonkingly good novel and hope an agent, and then an editor, get what you were trying to do. Somehow I managed to do that and no one is more astonished than me. I used to think that about magazine writers too, Cally, until I became one myself. Do you feel it was a natural progression, moving from short story to novel? It was a natural progression for me because I’d always wanted to write a novel but I know that, for some short story writers, the idea of writing a novel is a real anathema. It’s a long, long slog and you don’t get that lovely ‘I just finished a story’ buzz that you get dozens of times a year if you’re focussing on short stories. With novels you’re lucky if you get that once a year! When you write short stories you learn about the importance of an enticing beginning, three dimensional characters, pacing, plot, theme and a strong ending. What you don’t learn is how to craft sub plots or juggle multiple strands or points of view or how you sustain tension and mystery over a much, much longer story so writing my first novel wasn’t without its difficult moments. You can read a hundred different books on ‘how to write a novel’ but none of them can tell you how to craft your own story or how to fix its issues. Writing a novel made me realise why so many people ditch them after a few thousand words. You need stamina and determination to get to ‘The End’. Your two novels, Home For Christmas and your latest, The Accident, are very different. What prompted you to make the change from chick lit to psychological thriller? 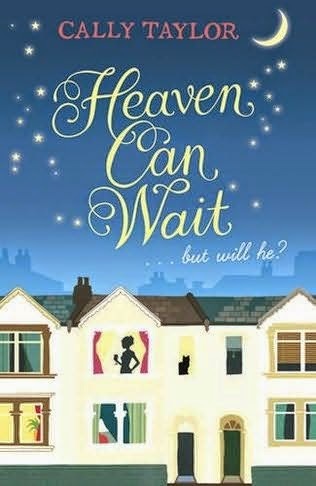 I was in a very different place in my personal life when I wrote my chicklit books Heaven Can Wait and Home for Christmas. I was in my early thirties, I was in a relationship but lived alone, and I didn’t have any children. 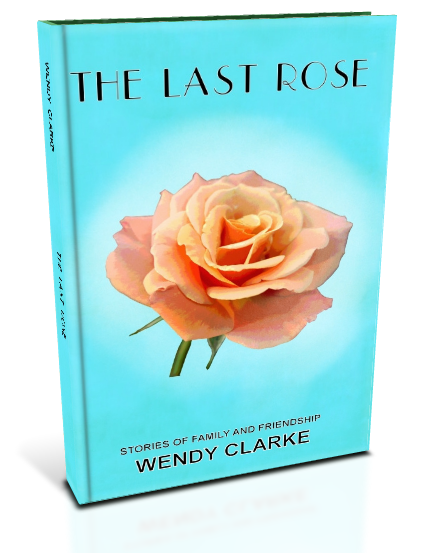 Like a lot of women at that stage of their life I was obsessed with love and romance and finding ‘the one’ and it felt natural to write romantic-comedies with themes that I could relate to. When I wrote The Accident, my debut psychological thriller, I was thirty-eight. I was living with my partner and we’d just had a child together. My priorities couldn’t have been more different. I’d found the security and the family life I’d always craved and I wanted to protect it and keep it safe. Psychological thrillers hinge on worst case scenarios – what if your child disappears? What if your husband has a terrible secret? What if you’re losing your mind? – and it didn’t take a huge leap of imagination to come up with a similar scenario for The Accident. Once I’d identified what my worst fears were the plot started to take shape. Which genre did you find easiest to write? 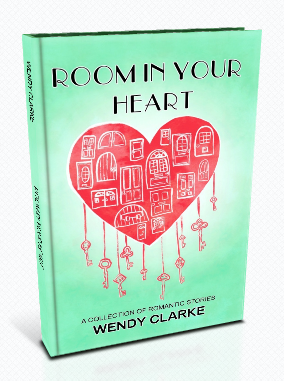 I can’t say that I find rom-coms easier to write than psychological thrillers or vice versa as there are elements of both genres that are tricky. With rom-coms I always worried that what made me laugh might not make the reader laugh, whilst with psychological thrillers the difficulty is getting the pace right. You need it to be pacey enough that your reader keeps turning the page but not at the expense of character development. You must be very excited that Home For Christmas has been made into a film. Did you have much input into it or did you have to hand over your baby and stand back? 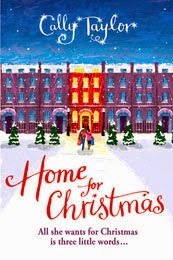 I am ridiculously excited that Home for Christmas is being made into a film. I’d heard of authors having their books optioned but knew the reality was that very few films are actually produced. As a result I didn’t let myself get too excited when Home for Christmas was optioned by JumpStart Productions. I couldn’t have underestimated them more because they did it, they got the film made, and I’m due to see the finished edit any day now (and I cannot WAIT!). After JumpStart optioned the film I was asked if I’d like to write the screenplay. At the time I was up to my eyes in UK and US edits for The Accident and, with a day job four days a week and a pre-schooler to look after the rest of the time I just didn’t have enough hours in the day. I happily agreed for Jamie, the director, to write the screenplay and gave feedback on it as and when I could. When I went to watch the filming I was there as an observer (and an extra for a few scenes!). Lots of authors say that writing a novel is like giving birth. If that’s the case then I gestated and birthed Home for Christmas but JumpStart adopted it and brought it up. It was still ‘my baby’ but different. Seeing the characters that had started life in my head actually come alive in front of my eyes was one of the most surreal and magical moments of my life. I have to confess, chick lit is not my reading of choice but Home For Christmas made me laugh out loud in places as it's very visual humour. Did you imagine it as a film as you were writing it? I never imagine any of my books as films when I plot them but I do visualize the scenes as I’m writing them. It’s funny because the editor who worked on Home for Christmas commented on how much slapstick there was in the book and said it tended to work better on screen than in novels so I cut quite a lot before the book was published. Lots remained though and I cannot WAIT to see the oyster scene in Home for Christmas. It’s one of my favourite scenes in any of my books and I just hope it looks as funny on screen as it did in my head. Were you happy with the choice of actors? I was delighted. Initially I didn’t think the main characters – April Pearson as Beth and Karl Davies as Matt – looked like the characters I’d created in my head but they nailed the nuances of their personalities and did a fabulous job. Other characters – like Mrs Blackstock and Grandad were spot on visually and I can’t wait to watch everyone interacting in the final film to see how well the chemistry works. Moving on now to your thriller. In The Accident, obsession and control play a large part in the plot. Is there an element of fact amongst the fiction? Yes, unfortunately there is. I escaped from an emotionally abusive relationship several years before I met my current partner. He never hit me but he was incredibly controlling, narcissistic and manipulative and I drew on the slow, subtle way he drew me into the relationship and the gradual diminishing of my self-esteem to create the relationship between Susan and James. Unlike my previous relationship James was physically and sexually abusive to Susan and those scenes were very hard to visualise and write. Your past comes back to haunt you is something that your heroine, Sue, finds out in your novel - do you think this is true? I do, and it’s something I’m exploring in my current book, Last Girl Standing, as well. I think we try and put the events of our pasts in little boxes and close the lid, especially if they’re painful, but everything that happens to us has an impact on our personalities and the way we behave. No one can ever completely escape their past. How long did The Accident take you to write? It took about six months to write the first draft and another three months to edit. If I’m honest I can’t really remember writing it! I was on maternity leave at the time and I was extremely sleep deprived. I know that you are at present working on your third novel, Last Girl Standing. Can you tell us something about it? Last Girl Standing is about friendship, deceit and murder. Jane Hughes works in an animal sanctuary in rural Wales and she’s in a fledgling relationship with Will, the local primary school teacher. She’s the happiest and most content she’s ever been – until she receives a note through the post that says, ‘I know your name’s not really Jane Hughes’. Someone from her past is after her, and they won’t stop until they destroy everything, and everyone, she loves. Thank you again for sharing your answers, Cally and we wish you well with your new novel. Cally Taylor is an author with two writing heads. Her Cally Taylor head writes romantic comedies and women’s fiction whilst her CL Taylor head writes dark psychological thrillers. 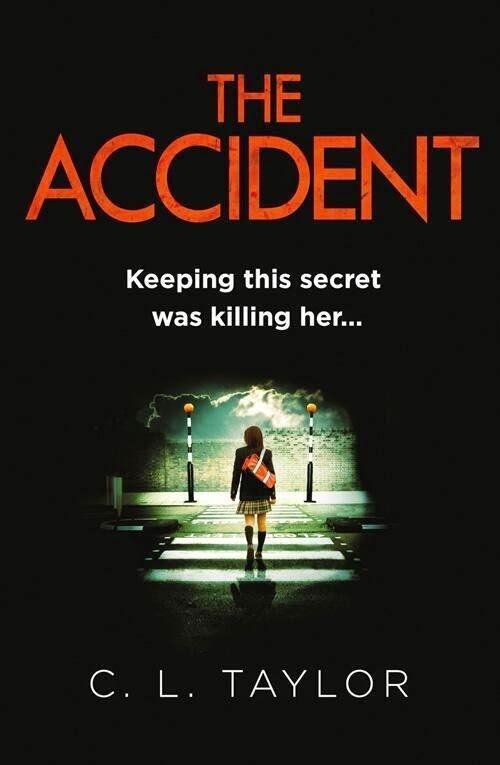 Cally’s latest - a dark psychological thriller called THE ACCIDENT (written as CL Taylor) - was published by Avon HarperCollins in April 2014 and in the USA (as BEFORE I WAKE) by Sourcebooks in June 2014. 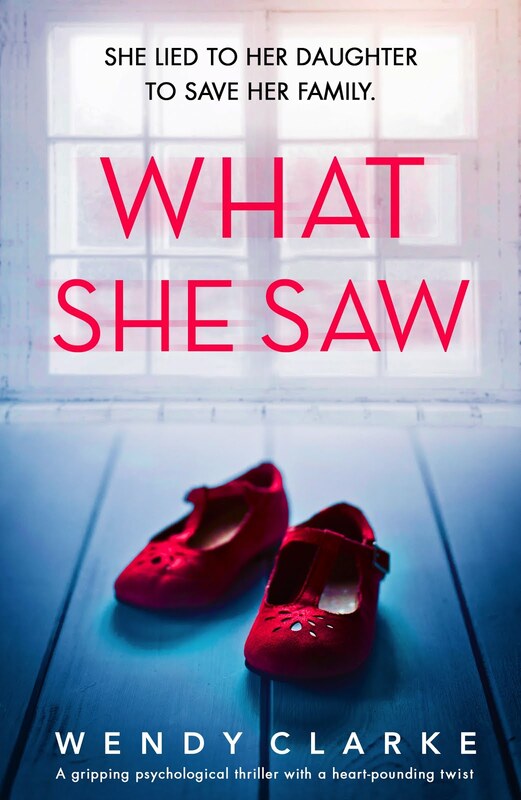 It shot into the top ten of Amazon.co.uk's Kindle chart within two weeks of release and rights have been sold to Germany, Italy, Russia, Brazil, Turkey and Poland. Her international bestselling romantic comedies, HEAVEN CAN WAIT and HOME FOR CHRISTMAS were published by Orion in the UK and translated into 14 languages. HOME FOR CHRISTMAS is being developed into a feature film by JumpStart Productions featuring Karl Davies, April Pearson, Lucy Griffiths and Derren Nesbitt. Shooting took place in April and May 2014 and the film will be premiered in December. We've just come back from a great holiday in the Dordogne. We stayed in the medieval town of La Roche Gageac on the banks of the river and the view above was taken from my bedroom window. It's years since I've holidayed in a country other than Greece and it did us good to be made to remember our classroom French - why should we always presume that people should speak English? We swam in our pool, visited Chateau, walked the cobbled streets of small villages such as Beynac and Rocamadour and of course ate too much - but what can you do when the markets such as the one below in Domme are filled with such wonderful produce? We hired canoes and having been driven 16km upstream, paddled back to our village. The photograph doesn't show how exhausted I was by the end of it and two of our family members ended up with badly sunburnt feet! It was great fun though. "What about the Troglodyte cave?" I hear you ask. It was a bed and breakfast just outside Loches in the Loire Valley. We stayed in it on our way back to Dieppe and it really was a cave! The conversion was amazing and the owners (who live in another cave) couldn't have been nicer. I have to say, though, that my night in the cave was the strangest experience. I woke to find the downstairs wood burner had sent strange shadows across our ceiling, like cave paintings! Our bedroom was on the first floor and below was a small sitting room and the second bedroom. We ate breakfast in a cave too! Now I'm home again, it's back to the writing. Luckily, as always when I've been away, I've come back with a wealth of ideas - I've just got to find time between the unpacking and the washing to write them down!